HSBC are leading the way in corporate responsibility and philanthropy. This video highlights their support of an initiative by Deakin University’s Blue Carbon Lab, in association with EarthWatch. The key stakeholders give us some background and invite us to get involved in a practical sense, supporting their research and developing ways to create a better global sustainable future and low carbon outcome. 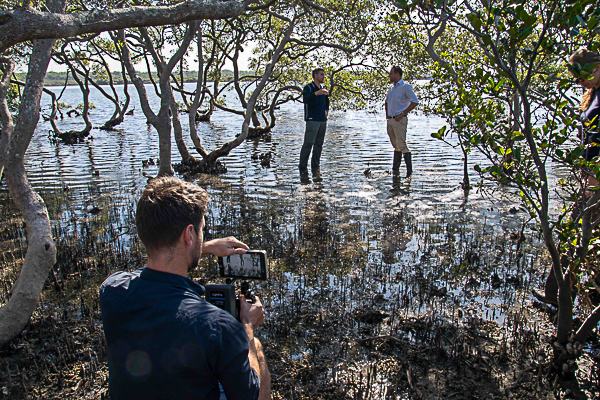 Content King’s practical involvement was to create this video which was a half-day shoot in a suburb of Sydney that has appropriate wetlands. It was a simple, but muddy, affair. The HSBC Water Programme is a $150 million investment in looking at ways to provide and sustain fresh water globally. It supports the science and commerce for a better future to combat the planet’s global warming crisis while maintaining a focus on economic growth and positive business opportunities. We edited the video using our presenters’ monologues (including some on-the-spot B-roll moments), some existing assets from the client and taking into account each presenter’s focus, and the overall tone of the messaging. We always craft a video specific to the clients brief while offering feedback that will enhance the final delivery. It’s always a pleasure and a privilege to work on these videos for HSBC.